"Dreams, music, moments of heroism and self-sacrifice, the sadness of great joy, pride in past suffering, etc., reveal that the original nature of the Will is not pleasure, but sublimity." "Sketch Notes for a New System of Philosophy" was Lindsay's title for a collection of notes, aphorisms and ideas gleaned from his notebooks. Each short entry is numbered, and, in total, the selection comes to over 530 items. The full manuscript is held in the National Library of Scotland, Edinburgh, but a selection has been printed several times in the years after Lindsay's death (see Publication, below). The notes are too short and eccentric to form a genuine "System", but, instead, are closer in spirit to records of breakthrough moments in his own thinking (or "aperçues" as Lindsay called them). As so often when the "I must write that down" impulse hits, the results don't always communicate the thought that led to the impulse, but some of the notes can help to understand Lindsay as a man and writer. Abraxas magazine has the published notes online. See their article index. David Lindsay's surviving letters to E H Visiak were published in Adam International Review in 1971. 1972, March — Lines Review Magazine #40, edited by Robin Fulton. Also contains extracts from The Witch and The Violet Apple introduced by J B Pick, and a review of The Strange Genius of David Lindsay. 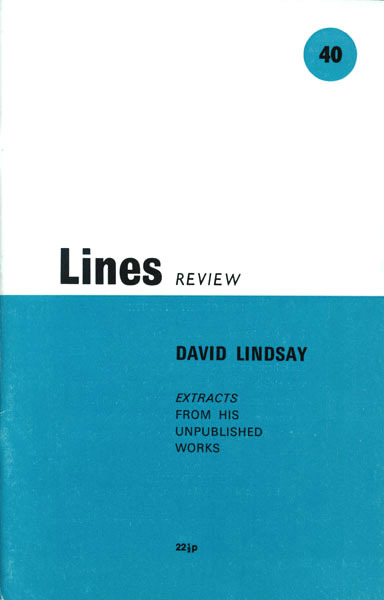 1996 — Abraxas #6 contains the notes published by Lines Review as "Philosophical Notes of David Lindsay", plus a further selection under the title "Twenty Philosophical Notes". See the magazine's site. 2002 — "Philosophical Aphorisms" collecting all previously published aphorisms, in Savoy Books UK HB of A Voyage to Arcturus. 1971 — Adam International Review volume XXXV, #346-348. 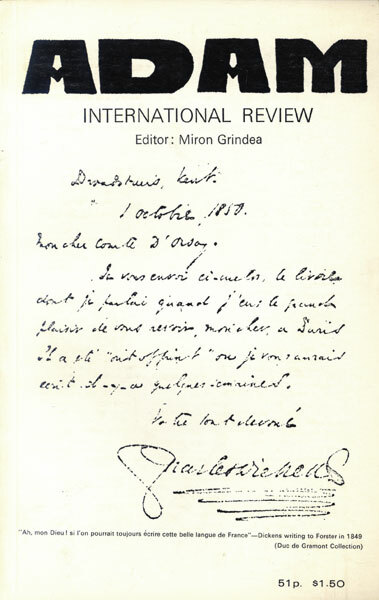 Pages 39–68 reprint letters written by David Lindsay to E H Visiak, starting with Lindsay's reply to Visiak's initial letter in 1921, and going on till 1940, totalling 35 letters by Lindsay in total. It also includes two letters from Victor Gollancz (to Visiak) about Lindsay, and one by Visiak to The Listener magazine in 1956, following on from the Third Programme adaptation of A Voyage to Arcturus. The rest of the magazine contains a variety of articles on Beethoven, Dickens, and others.